The 46.3 metre Northern Marine motor yacht Sorcha, listed for sale with Moran Yacht & Ship, has had a $3.45 million price reduction. Built in 2005 to ABS class, this superyacht has an exterior and interior styled by Setzer Design Group and features a composite hull and superstructure. She is MCA compliant and accommodates 10 guests in five cabins along with quarters for a crew of nine. Interiors on this yacht for sale are traditional featuring dark woods and cream carpets throughout. The elegant main saloon feature two sofas, two armchairs and two stools in elegantly patterned fabrics arranged around a coffee table while a separate formal dining room offer seating for 10 guests. Outdoor spaces include a large sun deck with comfortable seating as well as sun pads located forward. Twin 1597hp Caterpillar engines give her a maximum speed of 18 knots and a cruising speed of 11 knots. 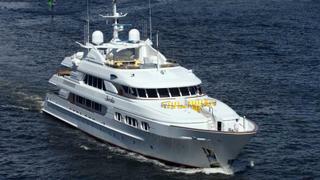 Currently lying in St. Petersburg, Florida, Sorcha is now asking $16.5 million.